The Free Medical Dictionary is a simple app that facilitates users to access all types of medical information easily. 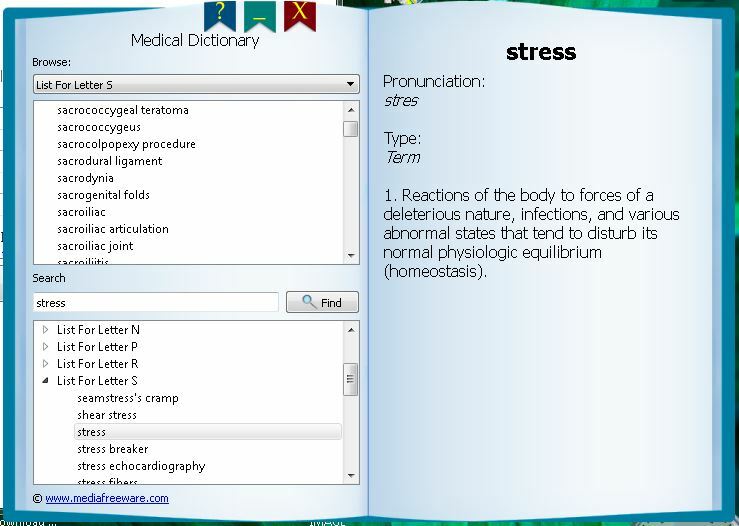 This free app includes a glossary of medical terms from different fields of medicine which can be searched easily. It is an easily searchable glossary which features details about various medical devices, health conditions and abbreviations. Users can also obtain information on pharmaceutical drugs. The Free Medical Dictionary is quite easy to install and uninstall. This simple and free app is broadly categorized into two parts which include the web search and the medical dictionary. Users can easily search in the medical dictionary area for symptoms or medical symptoms and terminologies by typing the word in the search box. Users can also search through the alphabetic listing for the required medical terminology. The search results are displayed clearly and accurately in the main interface which is easy to read. The web search in the Free Medical Dictionary is basically linked to the Google. It includes forward and backward navigation buttons which makes it simpler to search medical terms quickly. This software app has an auto-update feature and a wide selection of entries. This free app is quite ideal for medical students and researchers as a quick reference tool. The Free Medical Dictionary app is inclusive of various other beneficial features such as free updates, in-built spell check and many more. The latest version of this free software app features social network sharing and spell check search. The Free Medical Dictionary is an easy-to-download app which provides precise information on medical terminologies and various types of health conditions. Therefore it is a perfect software app which can be used freely by nurses, medical transcriptionists, doctors and medical students to access precise medical information.